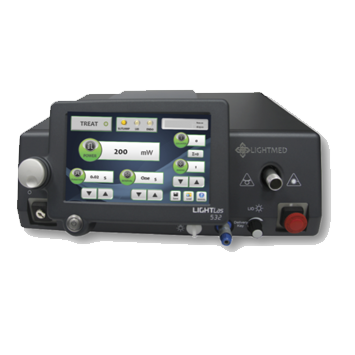 LIGHTLas 532 is LightMed’s 4th generation Green Laser Photocoagulator combining over 20 years of laser design excellence. The product introduces all-new highly innovative advancements in design of Diode Pumped Solid State (DPSS) technology with digitally controlled instant duty cycle electronics, designed for high activity use with ease for superior and reliable long-term performance. The ergonomic and portable design offers a flexible range of treatment modalities through a large range of delivery choices and system configuration options, assuring outstanding clinical versatility with ease and precision. Wavelength photocoagulation are further complemented by LightMed’s tissue friendly sp-mode™, permitting treatment at sub-threshold levels offering safe, versatile and repeatable management of Retinal and Glaucoma disorders. LightMed’s LIGHTLas 577 is in true-yellow 577nm with continuous (CW) and sp-mode™ modality. This machine has superior power output that produces 2.0W at every spot size. The LIGHTLas 577 has yellow wavelength that has optimum absorption by oxyhemoglobin that results in safer, more controllable, and faster treatment with very little patient discomfort and better post-op recovery. Also as a result of low light scatter and peak oxyhemoglobin absorption, typically 50% less power is required to achieve the same therapeutic effects as with the conventional green laser photocoagulation. The yellow wavelength in the laser also increases the safety margins for macular treatment which allows a much closer approach to fovea then the traditional 532nm laser. LightMed’s LIGHTLas 577 also features an sp-mode™function (also known as Sub-threshold Photcoagulation Mode ) that offers a novel and revolutionary approach in treatment of numerous retinal disorders with far greater safety margins and versatility of continuous wavelength lasers. The sp-mode™ delivers trains of short micro pulses, enhance treatment flexibility, and safety that is ideal for treatments near the macula. This modality is not a replacement of continuous wavelength, but a viable complement that demonstrates high efficacy on a large number of clinical applications that far exceeds those of conventional lasers. 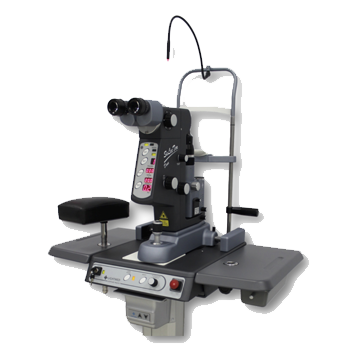 The LIGHTLas 577 uniquely integrates with our ultra high quality slit lamp. 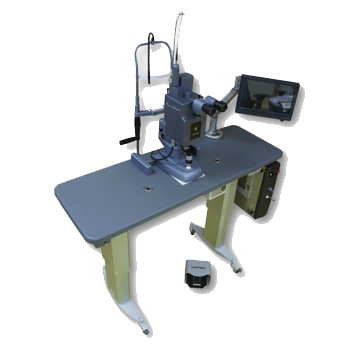 LightMed’s slit lamp has out- standing clinical functionality. Having 50-1000µm continuously variable spot size, the delivery system has enhanced clinical verstility superb energy density. Our slit lamp comes with an internal safety filter for a large field undistorted and a crystal clear view of the retina. Also the LIGHTLas 577 conviently can also become a combo or tri laser, connecting with our LIGHTLas YAG, LIGHTLas SLT or LIGHTLas SLT Duex. This causes an increase in practice clinical scope and an efficiency integrated work station. The LIGHTLas 532 also comes with a wireless power control foot pedal that allows for enhanced procedures and an advance detachable 7″ LCD touch screen interface with intuitive menus and treatment settings. 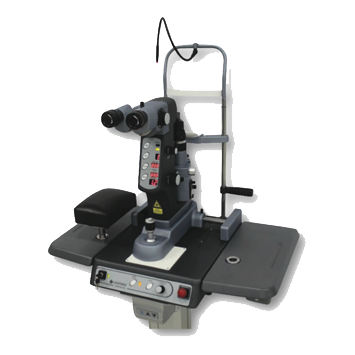 The LIGHTLas 810 is a next generation multi-purpose 810nm diode laser photocoagulator designed for use by ophthalmic surgeons for the treatment of various Retinal and Glaucoma diseases. It is one of the safest and most versatile single frequency lasers in the ophthalmic market due to its unique sp-mode™ and conventional continuous wavelength modalities. Being developed to suit surgeons, the LIGHTLas 810 was developed using the latest technologies. Being a semiconductor diode laser, the LightLas 810 is a reliable product that will provide the ophthalmologist with many years of trouble free operation, and coming with a case, can be easily transported to other hospitals and clinics. LIGHTLas SLT is a trademark product of LightMed Corporation, considered as the industry’s best SLT Laser. It is the most popular and widely applied laser photodisruptor in the market, providing unmatched blend of quality, precision, and features complemented by unmatched price. The LightMed’s SLT was designed to maximize the workflow of most dynamic practice in treatment of glaucoma procedures with ease, safety, and precision. LIGHTLas YAG is the trademark product of LightMed Corporation, considered as the industry’s best YAG Laser. It is the most popular and widely applied laser photodisruptor in the market, providing unmatched blend of quality, precision, and features complemented by unmatched price. LightMed’s YAG laser was designed to maximize the workflow of the most dynamic practice in treatment of posterior capsulotomy and iridtomy procedures with ease, safety, precision. The system is highly regarded for its superb versatility for use with various types of IOLs, assuring optimum clinical outcomes and eliminated lens pitting damage. The superior Crystal-Q laser cavity technology, and overall intelligent design of the LIGHTLas YAG assures exceptional life-span, consistent and accurate shot-to-shot output energy, making it unparallel in versatility and value. TruScan initiates the next generation of LightMed’s most ambitious ophthalmic laser family. The newly released mk-2 system features single and dual wavelengths with an intuitive and user-friendly design. Treatment outcomes are enhanced by pattern scanning laser delivery technology in traditional continuous wave (CW) and tissue friendly sub-threshold modalities, assuring exceptional clinical precision, speed, and versatility. 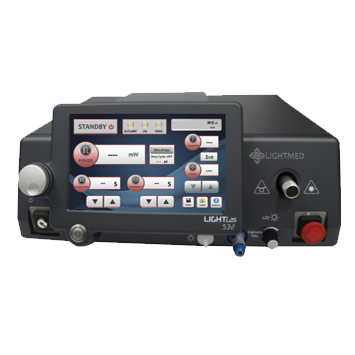 LightMed’s customary business model, offering “industry’s unmatched value lasers,” is again reinforced with the TruScan, making it the most featured and price competitive laser in its market segment. Available with a choice of single or dual wavelengths (532nm Green, 577nm True-Yellow, 670nm Red and 810nm Infrared), TruScan can cater for traditional or highly specialized clinical needs in all types of practices. TruScan offers the largest range of customizable patterns, assuring safer and more convenient application of the treatment laser, whether it is for rapid treatment or particular pathology. Superb optical design and laser cavity technology assure the highest standards of energy density, speed, and precision. Pattern scanning photocoagulation significantly enhances the conventional treatment outcomes and patient comfort levels. This superb traditional photocoagulation is complemented by LightMed’s tissue friendly sp-mode™ function, permitting treatment at sub-threshold level while offering safe, versatile, and repeatable management of retinal disorders and glaucoma. The technology induces relaxation duty cycles by chopping a continuous wave to microsecond pulses, thus reducing the laser-induced thermal tissue damage and laser side-effects.